Camping enthusiasts will know that the one thing you don’t want to be without when setting up for a night in the wilderness, is a reliable, bright camping lantern. No matter what you need to do – pitch your tent, make the fire and cook food, seek out the bathroom in the middle of the night – a dependable camping lantern call makes all the difference to the success of your trip. But how to choose between all the different options out there? We’ve selected the ten premier LED camping lanterns – so you can shop for the best light to suit your particular needs. If you favor light backpacking trips, then a collapsible lantern might be best for you; while, if you enjoy heading out on the water, you might look for a waterproof lantern to ensure the safety of your equipment in any circumstances. Here is our selection of the 10 Best Outdoor LED Camping Lanterns on the market today. Collapsible LED lanterns are brilliant for those who seek portability and practicality over everything else. While it is imperative to take some form of reliable lighting with you when camping, some lanterns can be bulky and difficult to store and carry. Collapsible lanterns address this issue head-on, providing a ‘fold-up’ solution for easily transporting your lantern in your tent bag or backpack. They are also great to store in a cupboard in the house in case of power outages. 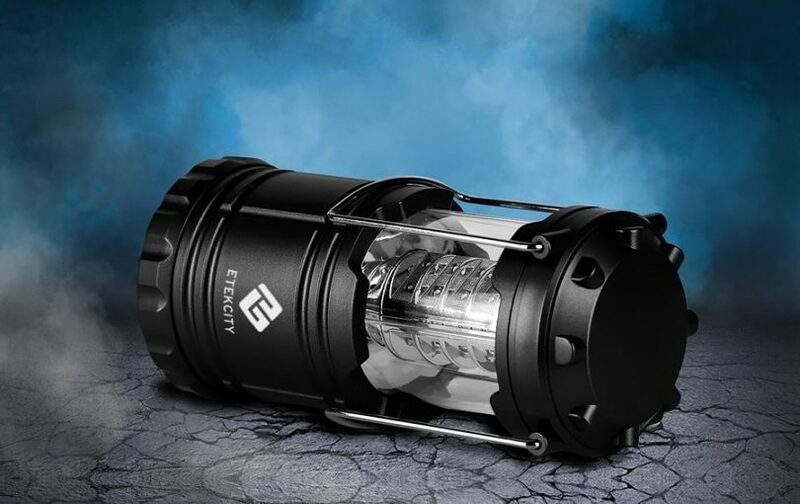 The Etekcity Portable Outdoor LED Camping Lantern earns our pick in this category because of its rugged design and excellent value for money. 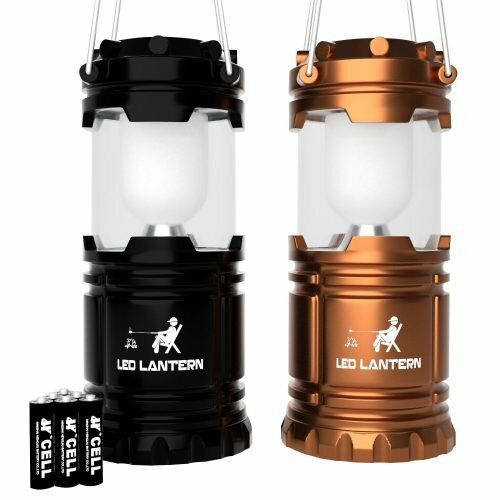 Buyers receive a ‘two-pack’ when purchasing this collapsible LED lantern – a pair of military-grade foldaway lights that measure just 4.9″ X 3.5″ when in the collapsed position. Weighing only 9.14 ounces each, these rugged lanterns are extremely portable and with withstand almost any conceivable shock or bump during your camping trip. The lanterns are comprised of 30 low-current consuming white-light-emitting diodes that put out a high-intensity light in an omnidirectional design. This 360-degree 60-lumen illumination is wonderful for campsites, and the lantern features fold-out handles for easy transportation while it is lit. The lanterns run on AA batteries (included with your order) and feature a power-saving design that allows for 12 hours of continuous operation (though the brightness will diminish over time to provide longer-lasting illumination). This power saving capacity is excellent for weekend trips, allowing you to use the lanterns over the course of two nights with without needing to change batteries. 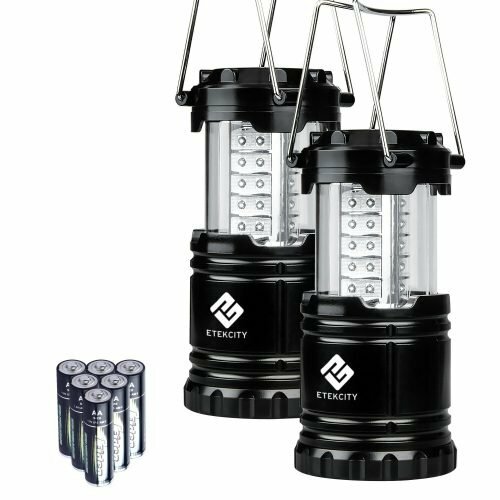 Those looking for a durable, convenient collapsible outdoor LED lantern should look no further than this ‘two-for-one’ deal from Etekcity. Featuring a great compromise between portability and performance, the only other real competitor in the collapsible market is this ultra-slim option from United time. Rechargeable LED lanterns are best for users who wish to avoid the hassle of replacing batteries for their camping lights. Rechargeable lanterns, moreover, generally offer longer life thanks to their sophisticated lithium-ion batteries, and some – like the Supernova Orion Ultimate Survival Rechargeable LED Lantern and Power Bank – are even able to charge your mobile phone or tablet when your device dies during an emergency. 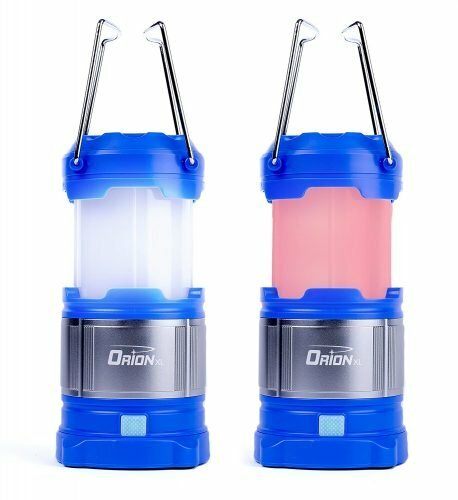 The Orion Ultimate Survival lantern is unique in that it runs off any combination of a single lithium 18650 Battery, dual lithium 18650 batteries, or 3 high capacity intervene AA batteries. These are all included with the lantern, and they can be recharged using the built-in 5200mAh Power Bank. The Power Bank charges the lantern’s batteries via a USB cable, and – as mentioned – can be used to charge any device that is able to draw power from a USB source. This is a fantastic feature for camping trips, where one’s phone battery inevitably dies before the end of the weekend. Simply take along the fully charged Power Bank and you can restore power to your important devices as well as your lantern. This lantern from Supernova features an attractive blue brushed steel design, and can, in fact, be collapsed down to 5 inches for easy storage and transportation. It also has a spring-loaded hanging hook for use in your tent or around the home or garden. Another nice feature is the choice of four different lighting modes – ultra bright, soft white, night vision red and emergency flashing red – just in case you need to communicate with your lantern in emergency situations. The Supernova Orion Ultimate Survival Rechargeable LED Lantern and Power Bank is backed by a 100% satisfaction, 5-year manufacturer’s warranty, and is a great choice for a rechargeable camping lantern. Many users suggest buying it simply for the super-handy power bank and the ability to recharge devices on the move. Solar-powered LED camping lanterns are perfect for adventurous types who enjoy extended outdoor trips, or who like to travel to remote locations where regular battery charging is not a feasible option. The most eco-friendly option on the market, solar-powered lanterns are famously low maintenance and are a natural choice for a ‘get away from it all’ weekend that features no electricity or other creature comforts. Moreover, with its funky look and extreme usability, the Suaoki Collapsible Clover Style 18 LED Camping Tent Lantern will appeal to design fans as well. This highly portable, foldable and durable lantern makes use of a ‘clover-style’ design and can be adjusted to effectively light any space of your choosing. As compact as an iPhone 6 plus when collapsed, the lantern takes up very little backpack space, and its hidden hanging hook design allows you to hang it in your tent or around the campfire at night. The three folding lampshades can be adjusted independently to direct the light towards a specific angle, or the lantern can be set up on its base – and it features three different lighting modes (high, low, SOS blinking) for added versatility. With one hour of full-sun exposure providing enough charge for 30 minutes of lighting, the lantern is well suited for camping trips – but there is also the option of ‘turbocharging’ the Suaoki using a USB cable. The lantern ingeniously features a Smart Protection Chip, meaning that the circuit will be guarded against overcharging and over-discharging. With its smart, attractive design and high functionality, the Suoaki Collapsible Clover Style 18 LED Camping Tent Lantern is a great option for those survivalist types who enjoy long camping getaways where the presence of modern conveniences like chargers and replacement batteries is not appreciated. Fans of water sports, extreme hiking trips or tough camping trails will probably want the peace of mind of buying a submersible, waterproof LED lantern. There is nothing worse than losing your lantern to a fishing boat accident or an unexpected downpour, and – if you spend a lot of time in the great outdoors – you will probably need to invest in one of these hardy, rugged light sources at some point in the future, so why not right now? 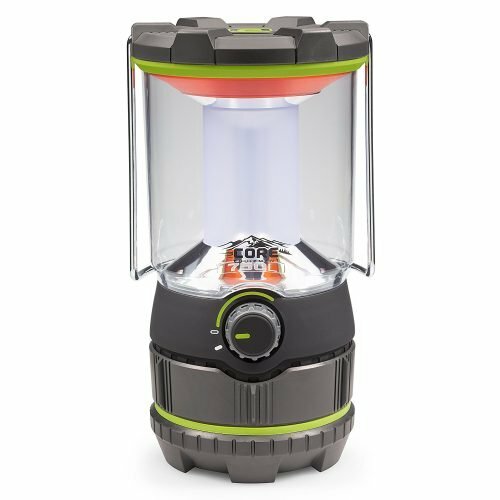 The Rayovac Sportsman camping lantern claims to be “virtually indestructible” – and it features an astonishing array of safety features that will survive even the roughest outdoor conditions. The lantern features an over-mold rubber head and shatterproof lens and reflector, making it safe for falls up to 15 feet. 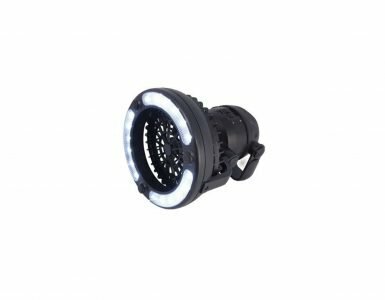 Not only that, but it is equipped with a fully waterproof and submersible Ansi IPX7 LED system – making it the ideal lantern for more adventurous pursuits such as night fishing or caving. In the ‘high’ setting, the beam has a reach of over 50 feet and offers a reasonable 5 hours of continuous battery life. Weighing 2.5 pounds and measuring 9.1 x 8.4 x 10.2 inches, it is not the most portable lantern on the market in terms of sheer backpack space. 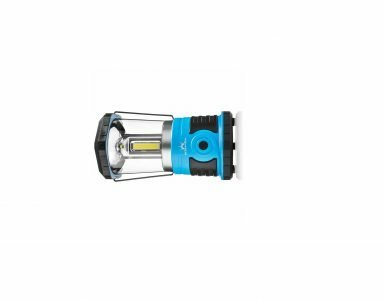 However, with an impressive output of 400 lumens in the high setting, the Rayovac Sportsman camping lantern is rugged enough to be the only light you will need to take along. Perhaps a bit too much for the weekend camper, but for those who are serious about the great outdoors will find this lantern to be more than a match for their needs. Sometimes extreme situations call for highly specialized equipment – and there are a number of high-lumen camping lanterns on the market for those who need to light large spaces quickly and effectively. Bright camping lanterns are also increasingly being used by professionals (such as decor artists and film technicians) because of their ability to light dark and out-of-the-way areas with minimum set up or fuss. 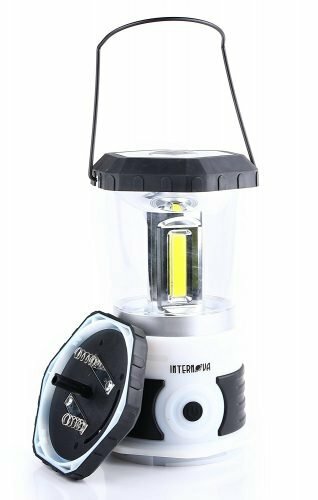 Our pick is the Internova Yeti 800 Monster LED Camping and Emergency Lantern – a solid, sturdy camping lantern that offers an incredible 800 lumens from its tri-strip LED system. Powered by four D batteries (not included), the Internova Yeti is one of the most potent lanterns available, offering a warm white light capable of illuminating an entire room in its maximum setting. Winner of a Best Extreme Outdoor Gear Gift award (2016), the lantern is not just a ‘monster’ when it comes to light performance, but also features an extremely useful retractable base hook for alternate hanging. This makes it a real winner for use around the home or garden in the event of a power outage. Given its 800-lumen output, the Internova Yeti 800 Monster LED Camping and Emergency Lantern has a surprisingly good battery life of 5 continuous hours of use in the maximum setting. An extremely solid option, but those who seek better battery life (perhaps for emergency situations such as hurricanes) should also check out the Blazin’ Bison 500-lumen option, which – though not as bright – will last longer in continuous use. This compact coyote green lantern looks both stylish and incredibly functional. It comes with D-rings built into the top and the bottom of the case; allowing you to securely strap it in any position. This is a great feature if you enjoy a variety of different outdoor activities. The D-Rings can be used to pin the lantern down to the ground or suspend it from the top of your tent; giving you just the amount of light you need. There are four white LEDs which provide an impressive 540 lumens on high setting. You can also opt for a medium light setting of 175 lumens or a low light of 33 lumens. Even better is the night vision feature. The Streamlight 44931 has one red C4 LED bulb. The power is just 10 lumens and, because it provides a red light, it does not affect your ability to see at night. Instead, it provides just enough light to assist you in moving around or locating specific objects; even in the pitch black. The lantern also features a useful SOS function. It will flash the emergency SOS code at a brightness of 10 lumens for up to 430 hours! This can make a vital difference if you are lost in the wilderness. As with most camping lanterns, you will need batteries. This particular model requires 3 ‘D’ batteries which should provide you with approximately 295 hours of light! Of course, this will depend upon the quality of the battery and it is always advisable to take spares! The battery compartment door is keyed; this is designed to make it easier to change the batteries in the middle of the night; if necessary. The lantern is easy to carry with you; it weighs just 14.4 pounds and measures 4 inches by 4 and 7.2 inches tall. It is made out of plastic but is strong enough to withstand most drops. It is also water resistant although not waterproof! Perhaps more impressive is the fact that it is designed to float and still work while doing so; or afterward. You may also be relieved to note that it has been tested for impact at 2 meters and can survive this type of drop without an issue. The base has a molded rubber cover to ensure the lantern is stable regardless of what surface you are placing it on. It is worth noting that the lantern comes with a limited lifetime warranty; this covers manufacturing faults, not any issues to do with misuse or accidental damage. The simple design of this lantern ensures that the light is cast in a full 360° pattern. The cover is made from polycarbonate and can be removed if required to increase the light levels. However, it is designed to reduce glare making it a more comfortable light. The lantern has built-in handles which can also be locked into position to ensure they do not become a hazard and provide additional strength for the lantern. You can even use these as additional hooking points. One feature which must be mentioned is the recessed power button. This ensures you do not accidentally turn on the lantern when in your bag. You will also find a battery power indicator in the switch which should, at the least, remind you to bring spare batteries with you. There s a reason why this product is in the list and says lanterns. Put simply for under $50 you will get four of these powerful lanterns. These lanterns are approved by the military as one of the best camping accessories you can purchase. They are made from military grade ABS and are designed to last for years; even in rugged or hostile conditions. The lanterns look stylish as well as being simple in design. A nice touch is that the four pack you purchase comes with one gold, one green, one blue and one black lantern. This makes it easy for every member of the family to have their own lantern! This feature also makes it easy to spot your lantern when in the wilderness; even when it is turned off. One very neat feature of this lantern is that it can be folded up. Or, more accurately, down. Each light will collapse into itself; ensuring it can fit into the smallest possible space. Make no mistake, this lantern is designed to be used in all weathers and all climates, whether you are enjoying a peaceful night in your tent or surviving a hurricane; these lanterns will keep working next to you. Each light requires 3 AA batteries; these are designed to last approximately 150 hours. Of course, as already mentioned the amount of life left in your batteries will depend upon the quality of the battery and how long they have been left in the light. Even unused batteries will slowly discharge in an appliance. 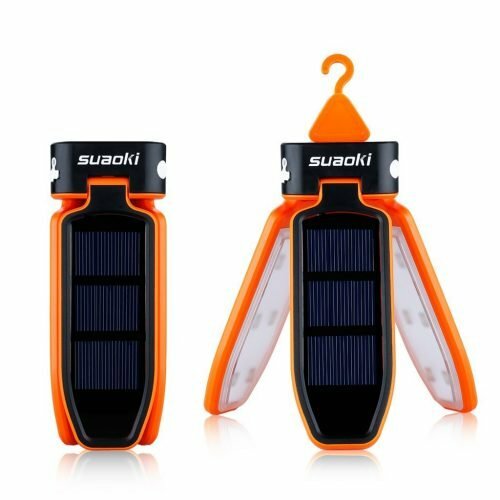 You can use rechargeable batteries in this product but you may find it difficult to recharge them while camping or surviving in the wild! Each lantern is 5 inches tall although if you leave the handle straight up this will extend to 7 inches. The diameter of the torch is just less than 3.5 inches. The handle can make a useful hanging point enabling a better overall light inside your tent. It is worth noting that the battery compartment is on the bottom of the lantern and has a screw holding it in place. This makes it a little trickier to replace the batteries n the dark but still doable. Inside each of the lanterns, you will find six LED’s which are all mounted on the top and face downwards. If you hang this inside your tent you may be surprised at how much it seems like a light at home. This is because it uses the same technique of refraction and reflection to send the light downwards onto you. The opaque cover helps to ensure the light is never dazzling, while the reflective internal base ensures all the light is directed to the room. In fact, this technique means that the MalloMe lantern can provide the same level of light as many lanterns which appear to be much more powerful. This is the perfect choice for lighting your tent; although a more direct light may be better if you are hiking at night. For the price, these are the perfect lanterns for you when camping. This lantern has earned the reputation for being the brightest possible CORE LED light available to buy. It is the perfect accessory for camping trips and simply to keep at home in case of emergencies. 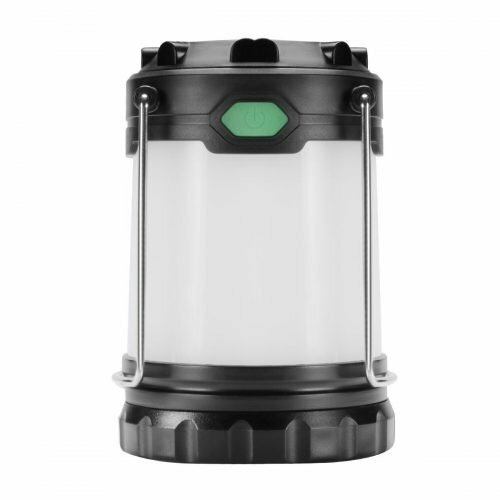 Providing you have batteries these lanterns can offer a convenient and practical solution in any situation which needs light; even just a trip into the basement to check an electrical fault. The light has a simple but effective design. It is made from high quality plastic and designed to resist impact; especially useful if accidentally dropped or kicked. In fact, it has been designed to distribute the shock of an impact through its impact resistant structure. The light features a diffuser tube which helps to ensure the light is evenly distributed and not pooled in one specific area. To further enhance its safety and rugged construction the handle is made of steel. The Core Cree LED lantern has three different power settings. The first is a full power which provides a huge 750 lumens. The light has a 14-meter beam range! The second is a low mode for when you need a more romantic light, do not wish to disturb someone or you are simply saving your batteries. This setting provides 30 lumens of light and provides a 3-meter beam range. Finally, there is also a night mode where the light is reduced to a pale 20 lumens. This helps you to see naturally in the dark without suffering from light blindness. The beam range on this setting just 1 meter. You might be interested to know that the night mode is actually an amber night as this does not interfere with your natural night vision. 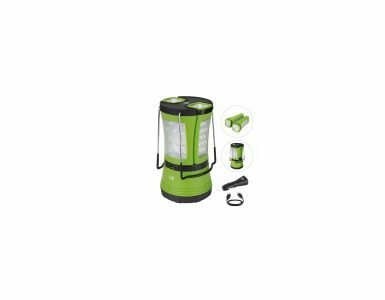 The lantern requires 4 ‘D’ batteries to operate properly; these are not included but you are able to use rechargeable ones. Running the light in high mode will dramatically shorten the life of the batteries; they are likely to last 10 hours. In medium mode, this extends to a much more impressive 50 hours while night mode will give you as much as 80 hours of light. The lantern is grey and green; fairly traditional for camping lanterns. It weighs, without batteries, just 1.89 pounds and measures 10.3 inches by 5.6 inches. Of course, this weight increases considerably when you add in the weight of 4 big batteries; and you may wish to carry spare ones! As mentioned, the lantern is designed to be resistant to impact. This includes making the lens out of shatterproof plastic. The dial to adjust the light setting protrudes from the side of the light; it is possible to knock this in transit and you may need to verify its setting before you turn it on; especially if it is night and you do not wish to be blinded! It is worth noting that this is a large lantern and may not be the best choice if you are hiking and have limited space. However, it does provide a huge amount of light which could be essential in a survival situation. A final point which must be mentioned if you are a resident of California you should be aware that this lantern does come under the category of proposition 65. This should be considered before you decide whether to purchase the lantern or not. However, for less than $50 you may find it hard to locate another lantern which offers this much light and is so well built. If you have the space for it while undertaking your favorite activity then this is the accessory you must have. Hillmax has been making quality electrical items for many years and has several offerings in the camping light range. 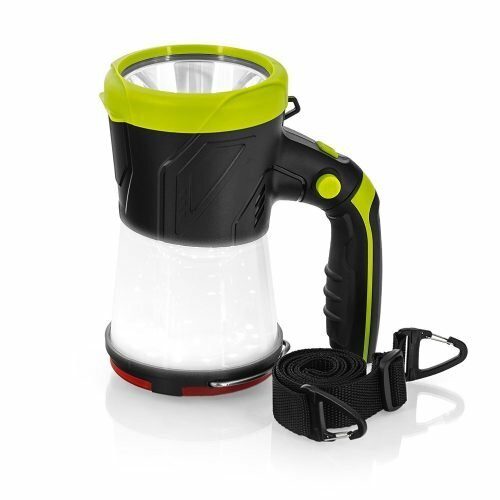 However, the range of features and quality if this camping lantern, with 3 LED modes, sets it apart as one of the top 10 camping lanterns that you should own. This lantern uses LEDs, but, instead of individual bulbs, it has chosen to use LED light strips. These run along the inside of the light and improve the efficiency and longevity of your light; something that is well worth considering if you find yourself in an emergency situation or even when camping. One feature which is particularly useful is the fact that this lantern will work on AA batteries or AAA batteries! This means you should be able to find some batteries to power it; regardless of where you are. What makes this feature particularly impressive is that you can install 4 AAA batteries on top of the 3 AA batteries; the lantern will automatically use the AAA batteries first and then switch to the AA batteries when the first set run out! This will ensure your lantern lasts in excess of 100 hours! Regardless of which battery type you choose the Hillmax lantern will provide you with 100 lumens of light. Better still, a specially designed material has been added to the lantern which allows the light to diffuse naturally. This ensures you are not blinded by the light and provides a good level of coverage across the tent or area. This is dramatically improved if the lantern is elevated; to a branch or the inside of your tent. An important feature of this light is that it is adjustable. You can choose the full power setting which provides a white light and 100 lumens. Or you can move to the low level which is a warm yellow glow at just 20 lumens. The medium setting obviously fits halfway between these two! The lantern is finished with zinc, giving it a professional, clean look and helping it to withstand the majority of weather conditions that you can throw at it. It is well made and durable, even if you accidentally drop it. Although not designated waterproof it is weather resistant and seems to hold up well in a variety of tough environments. The lantern weighs just 7 ounces and measures 5.2 inches tall with a diameter of 3.4 inches. It is stylish, yet compact making it the perfect accessory for your camping trip or the ideal addition to your emergency survival kit. The button is near the top of the lantern and is recessed to ensure it does not get switched on accidentally. The same button rotates through the three light settings, ensuring you have the perfect light for your needs. You will also find the carry handles are a convenient hanging point; allowing you to quickly clip it in place at the top of your tent and illuminate the entire space. Even an eight or ten man tent will be well lit up by this lantern. Perhaps the best feature of this lantern is actually the price. You should be able to pick one up for under $20; this means you can easily test it out for yourself for very little outlay or risk. The fact that it has made the top ten lists confirms you will not be disappointed! What is perhaps more surprising for the price is that batteries are included! Not only can you test the light instantly you can be amazed at just how good a price this powerful lantern is! You should be able to purchase this impressive lantern for between £30 and £50. Once you see the range of functions this offers you will quickly realize that this is an excellent price. Unlike many of the lanterns on this list, this one looks more like a conventional large torch. This is because it can be used as a torch or a lantern. In fact, it has 4 different functions. The light is held like a conventional torch and produces a powerful beam with an impressive 250 lumens. You will be able to see as far as 15 – 20 meters in front of you, depending upon the atmospheric conditions. On this setting, your torch should last approximately 3 hours. There is an option to reduce the power and have the torch last 11 hours. Alternatively, you can set it to strobe and it should run for 24 hours. This is particularly useful when trying to signal rescue teams. Simply stand the lantern on its torch base and select the 360° light mode. The light will pour out of the shatterproof plastic lantern part and illuminate the area for you. Again you can choose your setting. High power will give you 5 hours of light at 200 lumens while low power will give you 20 hours and the strobe option will go as high as 40 hours! This is operated in the same way as the 360° option. However, the key difference is that it will only utilize half the LED bulbs inside; illuminating just half the lantern. This will help to provide a better light for focus work while keeping your hands free and not disturbing sleeping friends. It will also extend the battery time. High power will now last for 10 hours, low for 30 and the strobe option will go for as long as 60! The lantern uses a lithium battery which is built into it and is rechargeable. It takes approximately 5 hours to fully charge this battery from empty. However, this is not the impressive fourth feature! The light comes with a USB cable built into it to allow this recharging and a port for connecting other items, such as your cell phone to this power source. The torch can actually recharge your phone! To ensure you know your capabilities there is a power display in the lantern which advises you on how much charge you have left; you will know if you are able to fully charge your phone or not and whether you want to. What may actually impress you the most with this versatile lantern is the fact that it weighs just 1.1 pounds; with the battery! The lantern is not just lightweight. It is also compact, measuring 7 inches by 6 inches by 4. This means it is easy to carry with you whether you are camping or walking the dogs! One additional feature which can be useful is that it is possible to rotate the handle; this can improve its stability on the ground or simply provide you with a better grip; if required. 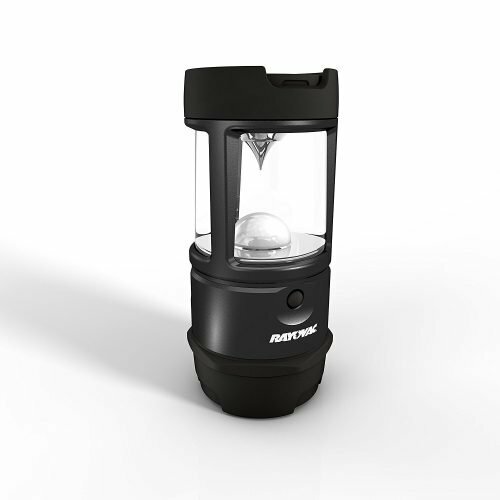 The lantern is made of shatter resistant plastic, ABS, and rubber. This will ensure it is resistant to the worst weather you can encounter and will still last for many years. It looks good as well! It also comes with a handy shoulder strap, hanging loop and a red light which can be used as a warning signal or to call for SOS. This uses virtually no battery and will outlast the strobe in an emergency scenario. It can also make a good night light to avoid being blinded in the dark but still have enough light to see what you are doing. There is no doubt that the market is flooded with potential lanterns for your camping or emergency needs. This can make it extremely difficult to choose the right one; the one which will work when you need it to and provide enough light. A camping lantern is essential for any camping trip; it is often overlooked and underrated but is one item that you simply cannot leave home without. Any light will help when you are in a tent or the great outdoors but the lanterns which have been included in this top ten are specifically designed to provide the maximum of light with the minimal battery usage. This can make the difference between a pleasurable and relaxing camping trip and one that leaves your more stressed and worn out than when you started. The first thing you must think about is what you intend to use the lantern for. Although these are described as camping lanterns there are excellent items to keep at home for an emergency. Of course, if you simply wish to go camping then you will need to consider the smallest and lightest option; especially if you are camping without a vehicle. As well as being easy to carry the lantern should be easy to access when needed and the battery will need to last for long enough, or you will need to allow for spares. Most lanterns are designed to be used without hands. This means standing them on the floor or tying them to the roof of your tent. It is important to consider if both these aspects are important; or if you need one element more than the other. Although many lanterns have flat bottoms this does not mean they will sit well on uneven ground. If you are likely to need your hands-free you need to be confident that the lantern will stay where you put it. This ensures your light is consistent and safe. The best options for this are the lanterns which have rubber bases or stands which can be adjusted to accommodate the ground beneath them. It is possible to consider a headlamp instead; however, these will generally focus on one area only and will not provide as much light as these lanterns. They are also likely to blind others while you may find that they are not as good for close work as you might expect. You will have noticed that there is an extensive range of brightness in the camping lanterns described. This is normal and it is important to consider what you really need. For instance, if you are an avid camping and love sitting in your tent playing cards with your family then you need a lantern that will suspend from the ceiling and light up the whole tent. One with 100 lumens will provide a similar light effect as a 60-watt bulb. The lanterns in this list range from night settings of just 10 lumens to powerful beams with 250. Knowing what you need will help you to choose the right one! It is a good idea to select a lantern that allows you to adjust the brightness according to your needs; this allows you to be prepared for almost any situation. Lanterns come in a variety of prices; this means there is one to fit every budget. What is interesting is that many of the cheaper products are as well built as the more expensive ones. For this reason, it is important to set your budget at a level you can reasonably afford; then find the right light or torch for your needs. Once you have established a budget it is important to stick to it. If possible it is worth visiting a local store and testing as many of the products as you can within your price range. Not only will this enable you to feel the quality of the build, it will also ensure you are aware of just how bright, (or dim) the lumen settings are. The bigger the lantern the more it weighs. This is generally true but not always the case. In line with considering your intentions, you need to decide what is the most comfortable size and weight to carry with you successfully on any trip. While style and functionality are important considerations it is just as essential to have one that you are comfortable with. If it is too heavy to move you are likely to leave it at home and not have it when you really need it! If you undertake a mixture of activities it is best to choose one lantern which will cover all the different functions you attend; including hiking through the mountains! If you find yourself stuck in the wilderness and need to use your lantern to check your situation then you need to know that it is easy to use. Your thumb or forefinger should naturally hover over the power switch; allowing you to turn the light on even in the dark. The reality of these lanterns, when used in an emergency situation, is that it will already be dark when you locate them. You need to be able to find the lantern easily and then guide your hand straight to the switch. As soon as you have light your situation will seem better! You should also consider how easy it is to locate the battery compartment and change the batteries without any light. In all probability, this should not be a scenario you are faced with, but it is a possibility. You will be upset if you have a top of the range camping lantern but are unable to use it simply because you cannot find a screwdriver to change the batteries. It is very important to look at the quality of the build. A good quality lantern will be weather resistant. In fact, you will note there are even some that can float. This may not seem important if you are simply keeping a lantern in case of a power outage. However, whether you are at home with your lantern, in a tent or hiking through the countryside you can never underestimate the usefulness of a weather resistant lantern. The better your lantern is built the more likely it is that it will survive years of being stored and then bashed around on a camping trip. This will ensure that when you really need it you can depend on it. Lanterns which use cheaper materials and lack the quality associated with premium brands are likely to fail when you need them the most. This does not mean you need to stay clear of the cheapest lanterns; they may be suitable for your needs. What you need to do is make sure they have been well made. Some lanterns are just lanterns; they offer a light when you need it and specify the lumen rating. But, there are also many lanterns which offer so much more. They may have variable light settings, an SOS function or be used as an effective torch. Some lanterns even have a radio function or the clever idea of running from two types of battery. Additional features should not be a deciding factor in your preliminary decisions. However, once you have narrowed down the options the additional features available can make a substantial difference to your decision. After all, if a lantern can be used in three different ways or as three different things it makes sense to purchase this one rather than the one which does just one thing. The important thing is not to get carried away with the capabilities of the lantern but to remember that it is a camping lantern first; it must do that job effectively! Before you select the right lantern for your needs and budget it is always worth looking at the reputation of a firm, the specific product and whether you know anyone with personal experience of the lantern you are considering. It is possible to find out this information through online forums. However, while many of these sites offer impartial advice it is important to verify the facts you have discovered with experiences from people who have actually used the product. While friends and family are generally the best options as they will always look after your interests, you can locate a lot of good information in online reviews. Whether you choose to listen to the recommendations or not is up to you, but they can provide some useful insight into whether the lantern is really the best one for your needs. What you should consider is whether the lantern is seen to be dependable and sustainable or whether it is likely to fail when you need it the most. While it is generally not a good idea to be tempted away from the lantern you know is best for you it is worth looking at what deals you can acquire. For instance, a lantern which is over your budget but comes with another piece of camping equipment you need could then be considered to be inside your budget! More and more of the lanterns you see on offer are now available with the option of a rechargeable battery; built into the device. This allows the lantern to be used to charge other devices. However, this will affect the length of time you can leave the lantern running for and you must consider if this is an essential requirement or one that is simply ‘cool’. Choosing the right lantern for your needs is not an easy decision. There are many variables to consider and it is extremely easy to be distracted by one that looks better or has additional functions. For this reason, it is essential to stick to the buying guide described here. This will help to ensure that you buy the best lantern for your needs and that it is there for you when you need it. You should also consider the fact that a second or even third lantern is a useful addition to your camping supplies. This does not mean that you need to purchase three lanterns the same! It is possible to choose a different one for each of the potential scenarios you could find yourself in. The most important factor in choosing the right lantern for your needs is to make sure that you stick to the buyers guide here and choose according to what you really need. A final point that should be noted is that the majority of camping lanterns have loops to enable them to be tied onto your tent or even a branch of a tree. This is a very useful addition. Not only should you make sure your lantern has a fastening loop, you should also verify that it is of good enough quality to survive repeated use. It is highly likely that others will not be as gentle with your light as you will! Above all, once you have purchased a lantern remember that batteries do corrode if left in any electrical item for an extended period of time and they do discharge. Unless you will be using it very regularly it is advisable to store the batteries with the lantern but not in it; along with any tools, you need to get into the battery compartment. Roadeavour has some good camping lanterns too. I purchased (2) Orion XLs based on your review, but found your description to be misleading or at best, vague and incomplete. Rather, the lighting modes are “High”, “Medium”, “Red”, and flashing “Red”. Your wording of “soft” lighting is a technical term, meaning a lower Kelvin rating than, say “Ultra Bright”, which is also tech term. Instead, I found through communicating with Orion customer service that the Kelvin ratings were UNKNOWN by the company. I returned mine via Amazon and refuse to purchase from any company that cannot make technical specs available, especially those so vital to health & wellness (while camping, in this case). Any one know of a mfg who makes a led 12v lantern that can be plugged into a trolling motor battery pack such as Minn Kota. Would make a great long lasting emergency light source. ?